If you think the millennial generation is politically inert, look again – and listen. Spring or fall you can hear the rumble of student demonstrators on college campuses calling for a halt to tuition hikes. In October 2014, at UC Berkeley, a hundred students staged an overnight occupation of the administration building as California’s Board of Regents were preparing to meet. “Fight the Hike,” vowed one student banner. “Education is a Right, not a Privilege,” stated another. “We Shouldn’t Need a Full-Time Job to be Full-Time Students,” shouted a third. Student protests had an impact. Initially, the California Regents rejected student demands and approved another round of tuition hikes. But Gov. Jerry Brown, heeding student demands, opposed the increase. He forged an agreement with University of California President Janet Napolitano to freeze tuition levels at ten major state campuses and to pay for rising costs, Brown agreed to increase state funding for those universities by 4% a year. In Iowa, too, students at the University of Iowa won a tuition freeze for the third year in a row. In short, the millennial generation’s cry for relief from the nightmare of soaring student debt is gaining traction. 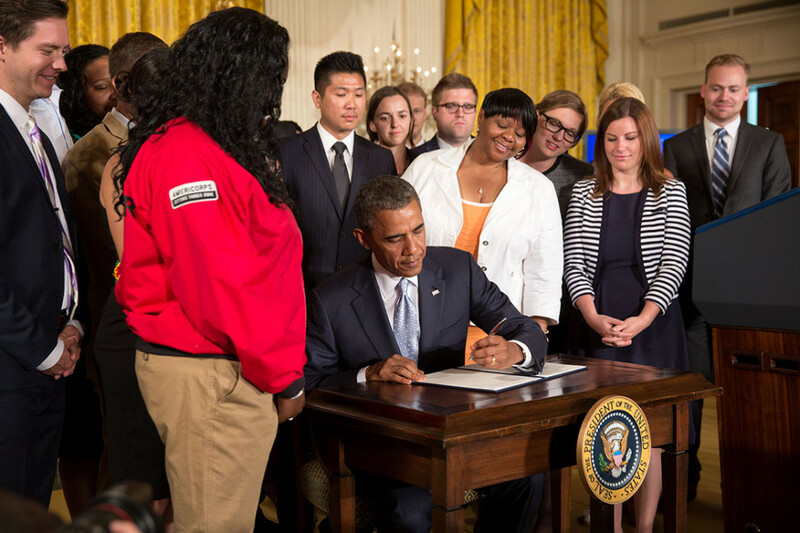 President Obama and several states are pushing for tuition free community college. 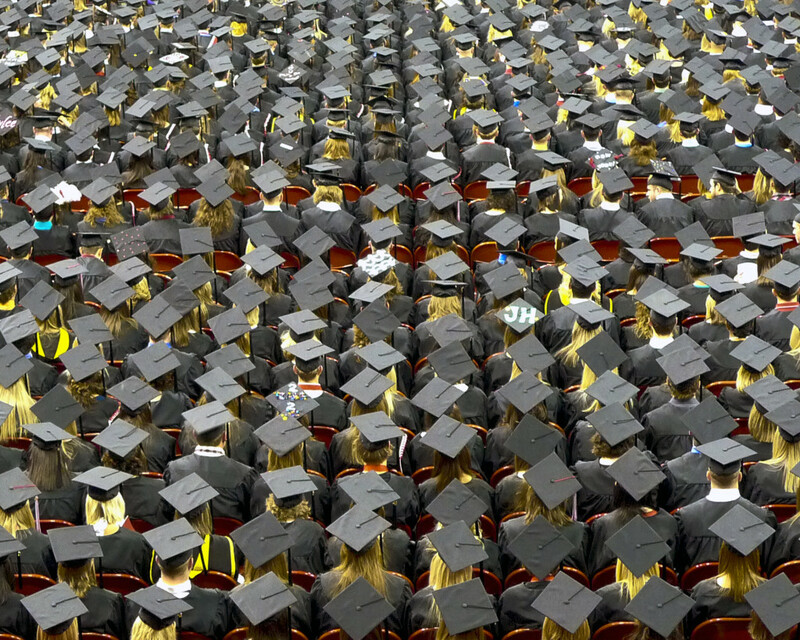 Think tanks are calling for a major new public investments in higher education. The Obama Education Department is cracking down on fraud at some for-profit colleges. And in June 2015, it broke new ground, offering debt forgiveness to thousands of students lured into debt by false promises and left with no degree, no job, and no practical way to repay. The Republican majority in Congress, which takes care of Wall Street, but not students, blocked Warren’s idea. 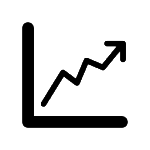 Even so, interest rates are falling on federal student loans in summer of 2016 and you can get an even lower rate if you sign up for automatic debit. Some government programs can lead to total loan forgiveness on work in certain public service jobs.. The most direct way to stem the rising tide of debt is to reduce the need for students to borrow heavily by making college more affordable through increased state and federal funding. That means reviving and acting on the long-held American belief that spending public funds on educating the next generation is a smart collective investment for the competitiveness of each state and the nation. Lately there have been harbingers of change. In Colorado, the 2014 legislative session added $100 million to funding for higher education. Regents of the University of Iowa agreed with students demands for a halt to tuition increases. Louisiana’s leaders have pledged no more cuts in state support for public colleges and universities and have appropriated $40 million in grants for colleges that graduate students with specific, highly needed job skills. Raising taxes on America’s super, super-rich, as proposed in the 2016 campaign, would generate enough federal funding to finance free tuition at four-year state universities and colleges across the country. Economists estimate that raising the federal income tax rate from 39.6% to 45% for the nation’s richest 0.1% (average family income $9.4 million) would raise $47 billion, enough to eliminate undergraduate tuition at all the four-year public institutions. Tennessee has already taken action, embracing what Republican Governor Bill Hassan calls The Tennessee Promise. Starting with college freshmen in September 2015, the state has been offering two years of tuition-free community or technical college to high school graduates – plus an added fifth semester, because 70% of incoming students need remedial courses. In July 2015, Oregon passed a similar tuition-free plan and put it into operation in February 2016. Proposals for similar programs have been submitted to state legislatures in states as diverse as Arizona, Illinois, Kentucky, Missisippi and Washington. President Obama was so taken with The Tennessee Promise that in his 2015 State of the Union address, he called for a nationwide “College Promise” program, offering two-years of tuition-free community college education “for everybody’s who’s willing to work for it.” He proposed that state and federal governments pool their resources, with Washington putting up 75% of the average cost of community college – tuition and fees paid upfront – and participating states paying 25%. The Republican Congress blocked the Obama plan, but in the 2016 presidential election, Vermont Senator Bernie Sanders lit a prairie fire by advocating free higher education at public universities and colleges. Millions of young people were drawn to Sanders by that idea, but it seemed to die with the election of Republican Donald Trump to the Presidency. In January 2017, New York Gov. 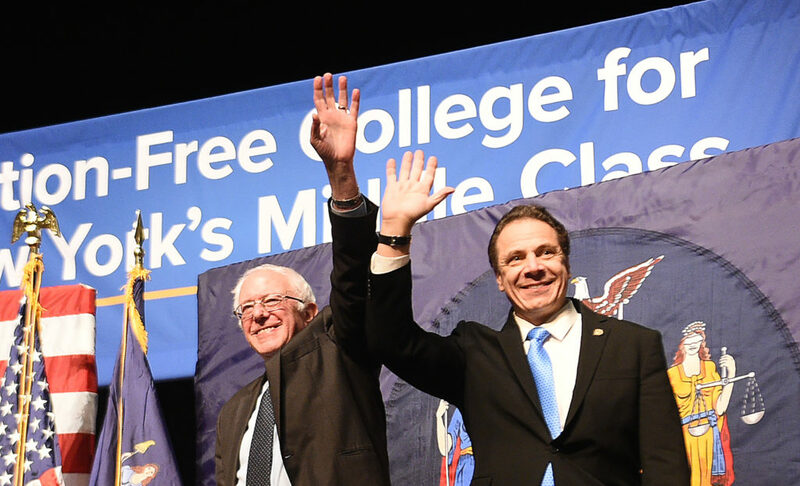 Andrew Cuomo took the plunge and got his legislature to adopt a program giving free tuition at two-year and four-year public universities for students whose family income is below $100,000 – upped to $125,000 in the 2018-19 school year. That’s worth $6,500 to this fall’s incoming freshmen and returning students, and already colleges in SUNY – State University of New York system – say the program is having powerful pull among students and parents. One major goal of Governor Cuomo is to keep young talent in-state rather than going out of state for higher education. At a campus like SUNY Purchase, officials expect roughly half of their 4,000 students to qualify. By the time the program is in full operation in 2019, officials expect that as many as 200,000 students statewide will qualify, costing the state an estimated $163 million in 2019. The President’s initiative taps an idea that has been kicking around among educators and policy think tanks for some time – generating significant new investment in higher education through a federal-state compact that would go beyond community colleges. States could qualify for federal money, by generating reliable new funding streams, seting outcome targets for universities, such as increased graduation rates, and pledging to provide outright grants to low-income students. An even more urgent need, some educators say, is to provide relief for the most vulnerable students from low-income families. Since 1972, Pell grants have been the main vehicle for bringing college education within reach of students whose family incomes fall below $30,000. But over the years Pell grants have lost purchasing power. Back in 1980, the maximum Pell award covered 77% of the cost of four years at a public university, but by 2011, that fell to 36%, according to the Education Trust. Pell grant students have become big borrowers. Over the last decade, their debt levels have shot up 90%. Time now, reformers say, to restore the Pell grant program to its original mission – paying for a four-year college education for low-income students. Another absolute necessity, many in Congress insist, is imposing clear, strong accountability on colleges. This means setting standards that reward colleges for high performance but also clamp down on universities that encourage students to rack up debt without qualifying them for good-paying jobs. Long-time chair of the Senate Education Committee Tom Harkin, an Iowa Democrat, declared that the sprawling market of 3,400 for-profit universities was “ripe for regulation.” Some, he noted, are more than 90% funded by taxpayer dollars through student loans, but have alarmingly high drop-out rates and very low graduation rates. More than two dozen states, from Massachusetts and Kansas to South Dakota, Utah and Washington, make taxpayer support for public colleges and universities contingent on educational success, using benchmarks such as graduation rates, dropout rates, student progress milestones, and the number of low-income and minority graduates. Another for-profit university chain operated by Education Management Corporation paid $95 million to settle federal charges that it engaged in what Attorney General Loretta Lynch called illegal, higher-pressure “boiler room” tactics to recruit students who were frequently unqualified and who got stuck with heavy loans. Federal funds provided $11 billion, or 90% of the revenue for colleges in EMC’s network, such as Argosy University, the Art Institute, Brown Mackie College and South University. 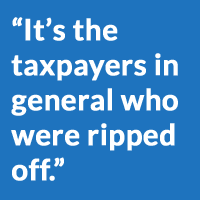 “It’s the taxpayers in general who were ripped off,” said an attorney for a whistleblower lawsuit that first exposed the firm. In September 2016, ITT Educational Services, under federal investigation and accused of widespread fraud and abuse, announced it was shutting down after the Education Department barred it from obtaining federal financial aid to enroll students. Once a darling of Wall Street investors, ITT had roughly 35,000 students and 8,000 employees. ITT claimed it had been targeted for political reasons and denounced the denial of federal funds as “inappropriate and unconstitutional.” But Ted Mitchell, Under Secretary of Education, said the federal government had no choice but to deny funds because ITT was unable to meet standards of academic accreditation, according to ITT’s own independent accreditor. President Trump and Education Secretary Betsy DeVos favor easing regulation of for-profit colleges. 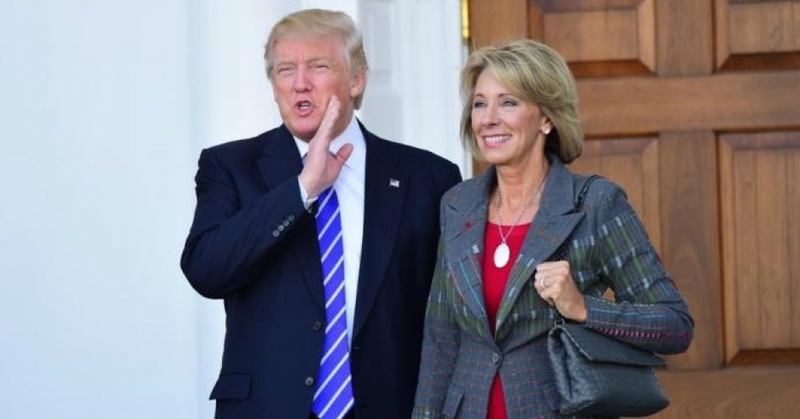 But with Donald Trump’s election and his selection of billionaire Betsy DeVos, a strong advocate of charter schools and private education, as Secretary of Education in 2017, the threat of crackdowns against abusive practices by for-profit universities eased so dramatically that Wall Street investors shot up their stock prices. Then, Secretary DeVos, responding to for-profit colleges, blocked an Obama Administration rule that to give financial relief to students cheated by for-profit colleges, some of which collapsed after being accused of widespread fraud, leaving students with huge debts and no degrees. California, Massachusetts, New York, Illinois and other states filed suit against DeVos and her Department of Education, charging them with failing to process claims for debt relief from more than 50,000 student borrowers trapped in the Corinthian College system. The Obama Administration found that Corinthian had misrepresented job placement and job prospect data to prospective students and that entitled borrowers to relief from their student loans. The collapse of the Corinthian system led to 15,000 underwater loans worth $247 million. State lawsuits accused the Eduction Department under DeVos of violating federal law by failing to act on a huge backlog of claims by student borrowers, caught in financial limbo and at risk of being charged with defaulting on their loans. #8 – Which Universities Do Well for Students? Under the Obama Administration, the Education Department launched its College Scorecard website to inform students and their families on how well universities and colleges do in lifting graduates into good jobs and careers and how much debt they have left students saddled with. Originally, the Obama Administration wanted to give grades to colleges and universities, but protests from some members of Congress stifled that idea. So the College Scorecard website omits grades but provides key information on graduation rates, average annual cost of college for those on student aid, and the median pay of graduates ten years after entering college. One surprise was the list of 23 mostly elite colleges offering a pathway to high-paying careers but with low cost education for students from low-income families. On the other hand, the Education Department found that fewer than half of the graduates from hundreds of colleges were making more money than the typical high school graduates – no payoff for student debt. And there were some surprising gaps in the track records of major state universities. Recent graduates from U.C.L.A. for example, had 30% less debt and were earning about 30% more money than graduates from Penn State. At prestigious schools like Duke and Princeton, women graduates earned significantly less than men. At the University of Alabama, roughly one fourth of students from low-income families had not paid back one cent of their student loans five years after graduation. At the University of Cincinnati, the figure was one-third; at Wayne State University in Detroit, over 40%, and at the for-profit University of Phoenix, two-thirds. But for students and graduates who have already piled up heavy debt, the most important reforms are those that make repayment doable. Most loans in the 1990s and early 2000s, especially from banks and private lenders, imposed onerous repayment terms during first ten years, leading to a high rate of defaults. To ease the financial pressures and to insure better payback performance, the Clinton, Bush and Obama Administrations have each taken steps to stretch out the repayment period and limit monthly charges in the early years after graduation. Then, in 2010 President Obama restructured the whole student loan program, defying intense lobbying from commercial banks and private lenders who had been raking in big profits under the protective umbrella of costly government loan guarantees. Obama’s plan, which passed the Senate by 65-32 and the House by 220-207, ended government guarantees for commercial loans, saving taxpayers $61 billion over the next decade. With those savings, the government was able to replace private bank loans with federal loans to students at easier terms. Another important recent policy trend has been to put a ceiling on just how much repayment is required from recent college graduates during their low-earning years. The Clinton administration capped monthly repayments at 20% of the borrower’s disposable income, after paying for basic living expenses. In 2007, the Bush administration dropped the repayment cap to 15% and forgave any unpaid loan balance after 25 years. In 2010, the Obama program set the repayment cap at 10%. Those improved terms have not yet had the impact that policy-makers had hoped because only a minority of student borrowers have taken advantage of them. One reason is that the stretched-out repayment terms were phased in slowly and did not take broad effect until 2014. But in time, current student borrowers will benefit from the another provision of the Obama reforms that forgives federal loan balances for borrowers who make regular on-time repayments for 20 years. 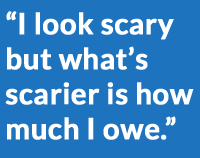 Student borrowers who go into public service, such as teachers, nurses, peace officers, members of the military or employees of public interest nonprofits, can qualify for loan forgiveness after 10 years of repayments. But in its most dramatic policy action, with near-term impact on debt-burdened students, the Obama Education Department announced in June 2015 that it was prepared to forgive and write off up to $3.5 billion in federal student loans if students could prove they were defrauded by colleges making false and fraudulent promises. This action was targeted at the 350,000 students that had enrolled at one of the 15 colleges in the Corinthian College network. But Obama’s Education Secretary Arne Duncan warned of further actions against predatory educators. “This is our first major action on this, but obviously it won’t be the last,” Duncan asserted. Other education officials explained that the process they were setting up to handle applications for debt relief from Corinthian students was designed to be “durable, not just for Corinthian but beyond” – that is, for students at other for-profit universities who felt they were defrauded. Protection of defrauded students was pursued by the Consumer Financial Protection Bureau which, in September 2017, required that National College Student Loan Trusts, one of nation’s largest holders of student debt, pay $19 million in penalties and refunds to student borrowers who had been defrauded or falsely sued by National Collegiate or its debt collector, Transworld Systems. In addition, the consumer bureau ordered National to hire an independent auditor to reviewits 800,000 student loans to check for possible further fraud against student borrowers. Because of masses of missing paperwork, National was also barred from collecting on any loan on which it lacks paperwork proving it owns an outstanding loan balance. In a parallel effort, a group called Strike Debt has been raising private donations to buy up students loans and write them off, adopting the market tactics of collection agencies that buy up poor-performing loans for pennies on the dollar. So for a little bit of money, Strike Debt can write off much larger loans. Strike Debt, which is an offshoot of Occupy Wall Street that seeks to protect debtors’ rights, has raised enough crowd-funded donations to abolish more than $13 million in student debt. Under its Rolling Jubilee program, it bought up the outstanding loans of 9,438 former students at Everest College and then simply canceled the remaining balances. “With education, people are trying to work to improve their lives – to make something better for themselves,” says Strike Debt organizer Laura Hanna. 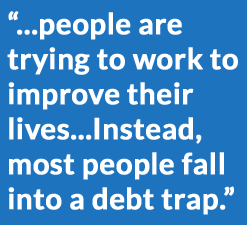 “Instead, most people fall into a debt trap. And there is no escape …not even through bankruptcy!” So Strike Debt steps in to stop the vicious cycle and liberate student borrowers from penury.